The European Commission stated it "considered the combined use of the five methods, amounted to torture, on the grounds that (a) the intensity of the stress, caused by techniques creating sensory deprivation "directly affects the personality physically and mentally"; (b) "the systematic application of the techniques for the purpose of inducing a person to give information shows a clear resemblance to those methods of systematic torture, which have been known over the ages.. as a modern system of torture, falling into the same category, as those systems.applied in previous times as a means of obtaining information and confessions." Forty years later despite a so called peace process, the British are still enforcing internment (albeit under a different title, sanitized to 'detention', without trial in British Occupied Ireland, while still torturing Irish political prisoners of conscience. The numbers are too numerous to list here, with 63 year old Martin Corey being just one of the better known victims. The European Court of Human Rights also later found the British were again guilty in the case of another Irish woman Mairead Farrell, who was shot in the back in cold blood by British Special Assassination Services unarmed in Gibraltar, along with her two comrades, the European Court found that the three had been unlawfully killed in breach of Article 2 - right to life, of the European Convention on Human Rights and criticized the British for lack of appropriate care in the control and their organisation in an an arrest operation. Despite a cosmetic Peace Process masking further repression, forty years later, the British are still enforcing internment without trial in British Occupied Ireland and still torturing Irish political prisoners of conscience. The numbers are too numerous to list here, with 63 year old Martin Corey just one of the better known victims. Martin's torture is more subtle and disguised now than the naked torture and brutality he first received from the jackboot, batons and fists of the British. An example being an emergency request that took almost a month for Martin to see the prison dentist, despite suffering ongoing intense pain. He was later told his initial request had been cancelled due to lack of transport. His ongoing treatment by sectarian appointed staff, make his daily life hard, very hard, because of his senior years and this blatant campaign of victimization which has been unrelenting for all of the 22 years starting with his torture in in Long Kesh Concentration Camp forty years ago. Martin's aged increasingly frail body, is daily wracked with pain, from all of the beatings and old injuries he received over the years of brutal beatings, but he is too foolishly, proud to personally complain. Another example of this petty approach by the British, to make his life hard, is a concerted campaign of victimization organized by the Prison Service against Martin Corey, when on the 11th of February, this year, Martin and two other prisoners submitted completed handcraft projects as St, Valentine’s Day as gifts for their wives and partners. The other two prisoners had visits with their loved collecting their craft items. Martin had a visit from his partner but when she went to the collection point requested by Martin, she was told there were no items for collection and to call back in a week. Several items left for Martin months ago were never received. Martin has still not received notice of his complaints being delivered to the Prison Ombudsman. Human rights activists who campaign on behalf of Martin Have have also been imprisoned by the British, with the chairperson of the release Martin Corey Committee, Cait Trainor being arrested for attending protests and sent to prison. Thousands of Irish republicans who marched in Lurgan, to highlight the internment of Martin Corey, quietly and peacefully, were met by the RUC/PSNI and were informed that they were taking part in illegal parades and that prosecutions would follow, with every participant recorded and followed on police video cameras. In the following days a many people were awakened at daybreak by the British taken from their homes, questioned about their involvement in an "illegal parade" and informed they would be facing legal proceedings. Subsequently 14 Irish Republicans sat through a three day trial accused of taking part in an "illegal parade". All were "convicted" with participating in an illegal Parade with two people further convicted of organizing the parade. All 14 people were convicted, some given fined while others were imprisoned in Maghaberry and Hydebank Wood. All of this contrasted to the weeks of "illegal" parading by British loyalist flag protesters in the same area, who got 5 star RUC comfort treatment, despite days of rioting, with nationalist homes under attack and countless roads blocked, while the RUC in Portadown facilitated their marches weekly for months on end, until they were forced eventually to take token action. Campaigners for Martin, as in this instance, have received death threats from agents hired by the British secret service. All of this is meant to silent support for those campaigning for the release of Martin Corey. Martin Corey who has been interned now on this latest occasion for over three years without charge or trial, was ordered to be immediately released by a Judge Treacy, who ruled that Martin Corey's human rights had been breached and that he should be released immediately. This was overruled by the un-elected British Viceroyal, as Martin Corey sat in the reception of the prison, with his belongings packed, waiting to embrace his family, waiting outside the prison gate. Naturally they were distraught when the British government underhandedly intervened and blocked his release and he was interned again, with an undemocratic British order, overruling their own injustice system. Martin's local lawyer Rosemary Nelson in Lurgan was murdered by British state agents, while the lawyer Pat Finucane, who was an expert on European Law, where Martin now is forced to take his case, has also been murdered by British state agents. The local journalist in Lurgan who would normally highlight cases such as Martin's plight in the media, was also murdered by British state agents. This citizen journalist along with others who have also tried to publish the daily injustice of British Occupied Ireland, have been censored in Ireland and have received death threats from hired British agents. Peter Murphy, Martin's lawyer says, Martin Corey has been denied the right to a fair trial, "It's like internment all over again in the sense that he hasn't been given the chance to defend his position. When we ask questions about the nature of the allegations and evidence against our client we are told nothing.In any criminal court you can meet your accuser, you have a chance to cross-examine them, and you have a chance to defend yourself because you're given the detail of what the allegations are against you. We don't have any of that, so our client is in a very difficult situation in that he's sitting in prison not knowing why he's there." 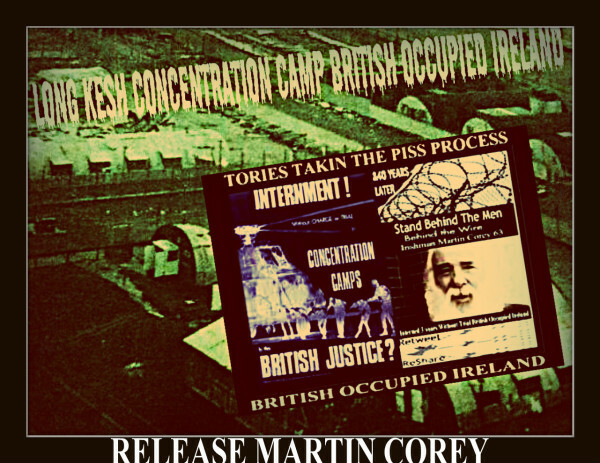 Martin's lawyers are to challenge the internment of Martin Corey in the European courts, if both they and Martin live long enough to actually get there. With Britain's record on human rights, its hard to say. The British cover their dirty tracks, with regard to their inhumanity, by cosmetically sanitizing it, renaming internment without trial as 'detention', by renaming Long Kesh Concentration Camp as the H-Blocks but then with further bad publicity following the deaths of 10 hunger strikers, they renamed it the Maze. Now the British plan to demolish most of it and have moved the political internees into a political prison, hidden within a criminal prison, called Maghaberry, where political internees wait for years on secret service trials, of which they have no details of charges, length of sentence, or content of secret evidence of paid informers. So it is obviously impossible to defend oneself in such circumstance. A secret court is obviously not a trial at all, except in the twisted perception of the most twisted, ever expanding secret service, injustice racketeers, paid for by British taxpayer monies. Martin Corey is essentially at 63 an old man, whose active freedom fighting days are long past in militant sense of defending his local community but from the British perspective, any truth teller is a subversive. Martin is being held up as an example through internment, as a stick to wave at the thousands of ex-prisoners and comrades of Martin, who have been processed and interned for years, in what is still known as Long Kesh Concentration Camp by all freedom loving people, worldwide. 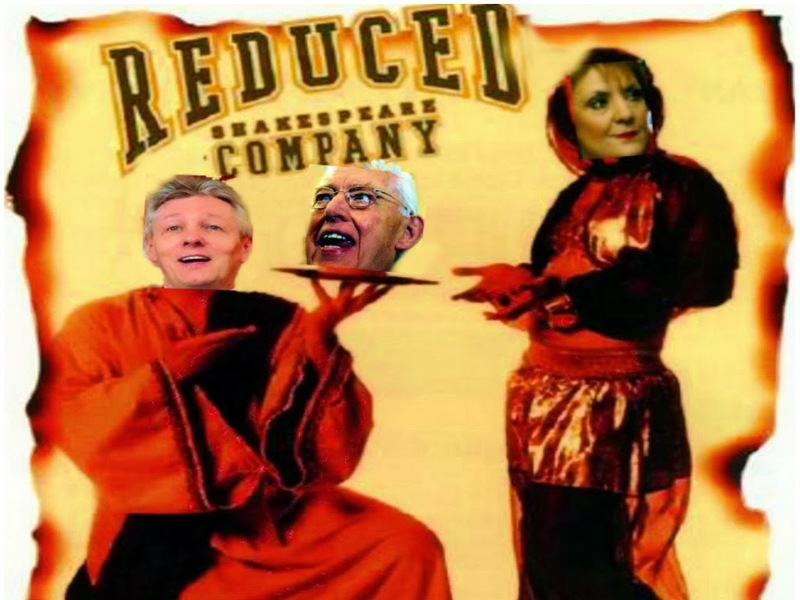 The British under the guise of the essentially nowdefunct Peace Process, are buying off possible resistance, with lucrative careers on policing boards, committees, sham local parliaments for those willing to stay quiet about all of this injustice and to collude with the British, in their repression of Irish communities, to essentially keep them quiet, about all of this sectarian, racist injustice, that is a central feature, in the maintenance of this scum British statelet, created and maintained strictly on a sectarian headcount. With propaganda they would have the Irish working class believe, that they are enemy, not the British whose policy in Ireland, is always, divide and conquer. This is the essential background to Martin Corey's predicament who after the murder of 14 innocent, unarmed, civil rights demonstrators, defended his Irish community in Lurgan, who were invaded almost daily, by British sponsored death squads, often in the disguise of RUC uniforms, murdering at random on a religious basis, peaceful people in their homes. Martin who shot these RUC invaders, who were subsequently disgraced and disbanded, in the course of his unselfish defence his community, against all the odds, has served 22 years for essentially being a patriot of political conscience, defending his community. end of the year, take such steps as are necessary in their jurisdictions to resolve this difficulty so that those concerned are no longer pursued. In this contrived open prison, British society, which is as sick as its many, many secrets, Gerry Adams has refused to clarify the details about all of this, playing politics with occasional feint support for the aging, frail, tortured body of Martin Corey. In the interest of justice and possible republican unity at this point, I will not elaborate further on this matter. However bearing in mind Martin Corey's elderly years, this in not tenable, indefinitely. Bottom line Gerry Adams and his colleagues do have the power to Release Martin Corey immediately. For those of you sitting on the fence, please bring it to their attention, that you are aware of this and they have as elected officials albeit British, have moral responsibilities now meant to be accountable, as highly paid British ministers have with their commoners, with regard to all of these injustices, that are destroying the basis of an enduring, genuine, Peace Process. GET OFF UP YOUR KNEES, YOU FEKIN EEJIT !